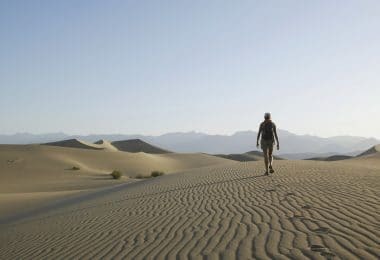 If you’re spending plenty of time outdoors, then you’re probably aware of the fact that emergencies do happen and require you to have the right tools for you. Since carrying plenty of tools isn’t always possible, a good hatchet may come in to save the day for twice less the load of your regular axe! However, picking the best survival hatchet for you isn’t easy! Your next hatchet won’t only come in hand for chopping wood or staking your tent but it could also save your life. Ideally, the hatchet you choose needs to be strong, yet light enough to carry. 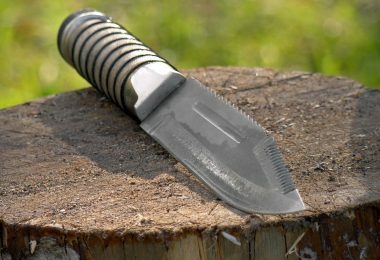 The blade should be of good quality steel and with a sharp edge, but the handle should be easy to grip and durable as well. Since deciding what it is that you need isn’t easy, we decided to inform you about the most important features you should look for when shopping. We have also decided to give you a review of some of the top-notch survival hatchets on the market today. After reading our review, you should be able to decide which of these best suits your needs and budget. 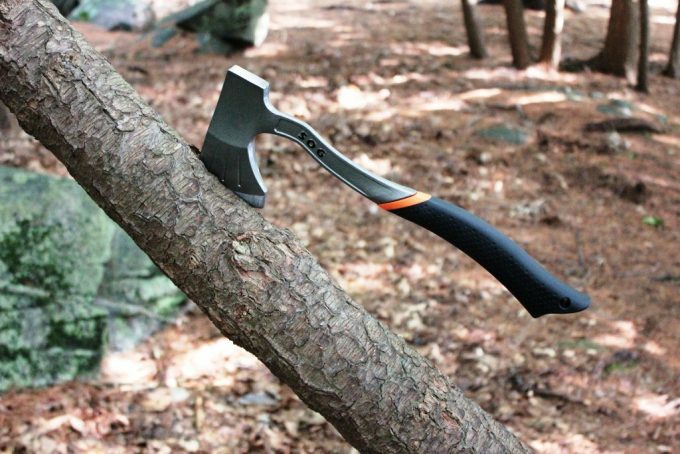 Here are a few things we think may matter the most when it comes to buying the right hatchet. You want to buy a hatchet that is both of high quality and highly functional. A heavier head on the hatchet will provide more power, but you lose accuracy if it becomes too heavy. This also holds true for the handle; a longer handle means more force and power, but it also means you have less control. A lighter hatchet will be easier to carry with you but may not be powerful enough for what you want, so you need to think about what you will be using the hatchet for. If it’s too light or the blade edge too thin, then it may break easily. What type of handle does the hatchet have? When asking yourself this, think about the material that is used to make the handle. You want a handle that is corrosion resistant and strong. Hardwoods like hickory are good for handles, and will make a strong attractive handle provided the wood grain runs vertically. However, wood can rot so you need to ensure it is protected. Other materials that are used include composites and fiberglass which provides a good grip, are light and won’t rot. Check that the handle is not too smooth, if it is varnished it may be slippery and you could lose your grip on it when swinging. It should also be shock resistant to some extent so that you don’t feel the impact as you hit the wood. The handle may be curved or straight. A curved handle tends to be a bit better as it feels more natural when swinging. The head of the hatchet is the most important part of the hatchet. You need to consider what it is made of. Have they used a high-quality steel? The better heads are forged of high carbon steel. Stainless steel is inferior to forged steel and will not be as strong or durable. How sharp is the blade and how long does it remain sharp? This is also important as you don’t want to have to be constantly sharpening the blade edge. The type of hatchet blade is also very important because each type has its pros and cons. A cutting blade usually has a thin sharp blade and a tapered head. To split logs though, you need a thicker blade with a wider profile to give more force, so the head of these hatchets is more wedge-shaped. Some hatchets come with a hammer pommel, which is very useful for hammering in tent stakes when setting up camp. Be sure you have a decent edge guard or sheath to cover the blade for safety and to protect the blade. For protection of the blade and for your own safety, the hatchet should come with a sheath that covers the blade. If it doesn’t come with a blade sheath, then you risk injuring yourself on the sharp edge of the blade. Blade sheaths vary in quality. Some are made of cheap plastic that won’t last long, while others are of Kydex or leather. The leather sheaths are very nice and will last long. If you do buy a hatchet without a decent sheath, then you should choose a good quality sheath that fits the size of the head and completely covers the blade. It obviously also depends on your budget with the price range varying quite considerably from the very low to the very high. It really depends on what you want, how you will be using your hatchet and how much you are willing to spend. We have given you several questions you should ask yourself before considering what hatchet to buy. Bearing all of this in mind, now it’s time to go over some more popular products on today’s market. We have provided reviews below on the best hatchets on the market today. Reading these will help you to decide which hatchet will best suit your needs. 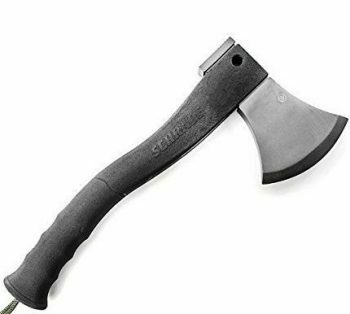 The Schrade SCAXE10 Full Tang Hatchet has a powder coated 3Cr13 stainless steel head with a hammer pommel. The pommel does not have a crosshatch design the way some hatchets have, but it is adequate and does get the job done. The hammer works well for pounding in tent stakes, whether plastic, wood or metal. The back edge of the hatchet has a shallow curve shape that makes pounding stakes in a little difficult. The blade is not as sharp as other hatchets and may need to be sharpened before use. The handle of the hatchet is of black TPR rubber. The rubber is good for absorbing the vibrations when chopping. The handle is also textured with shallow finger grooves on the front of the handle that allows for a good grip. It has a nylon lanyard attached to a lanyard hole. This hatchet comes with a thermoplastic belt sheath. The sheath is not very durable since it is of plastic and it also does not fully cover the blade which means you can hurt yourself if you are not careful. It also may be hard to get a belt to fit through the sheath. 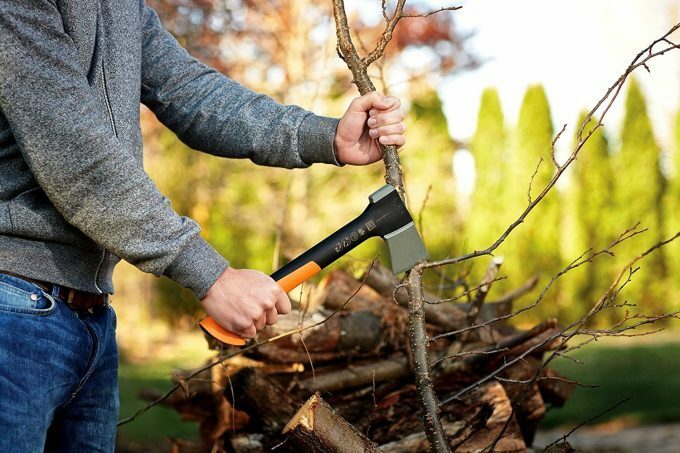 The hatchet will split 4-inch diameter wood, but can’t be used on large pieces of wood, hardwoods or cutting down trees. It can be used to chop firewood, make traps and pound tent stakes. This is a small hatchet, which is handy to use on a camping trip, and very convenient for carrying in a backpack or survival pack. It is well-balanced with a small handle providing good control of the hatchet. The blade edge is also sharp. Related: Since the plastic sheath is not durable and does not work very well, we recommend buying a better quality sheath for this hatchet. 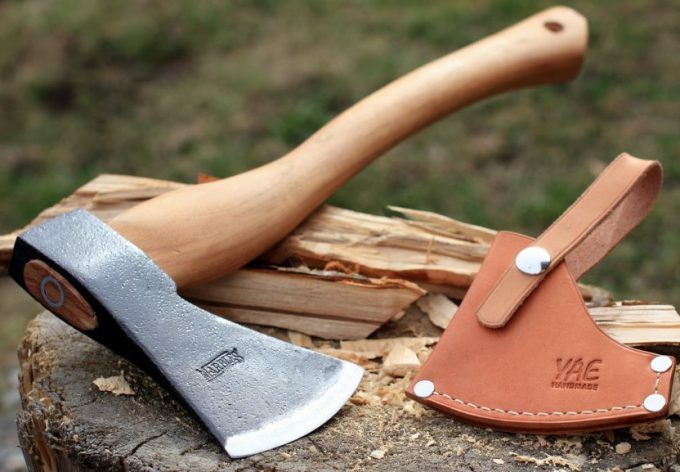 We recommend the Timberline Axe Hatchet Leather Sheath which would fit the head of this hatchet. This sheath is 4.5 inches wide by 5.13 inches tall so will cover the entire head of the hatchet. 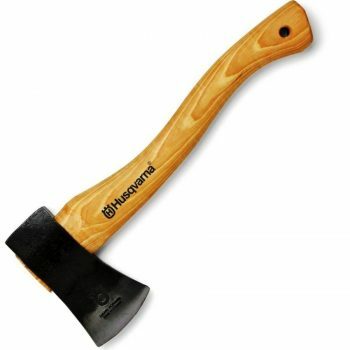 The Husqvarna 13″ Wooden Hatchet is a very attractive hand-forged Swedish hatchet made of high-quality Swedish ax steel. It has a fine-grained hickory wooden handle. The handle might shrink if kept in too warm conditions. It has a nice feel to the handle and is easy to swing. 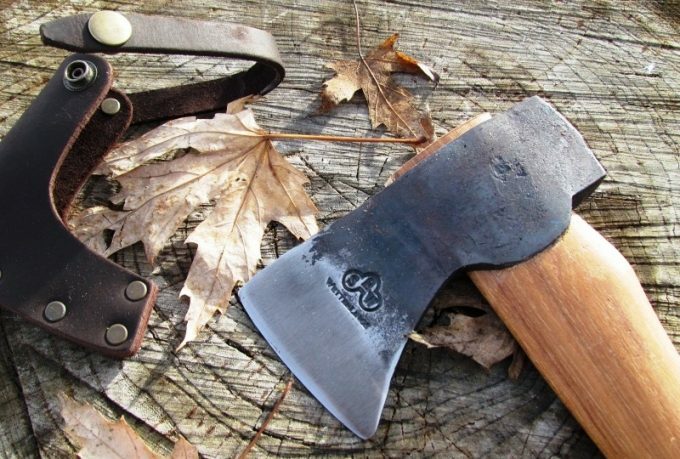 This is a great hatchet for carving, hewing, and splitting kindling. It is very well designed, and the workmanship is very good. It is a very solid hatchet but may need to be sharpened when you get it. The blade will cut through an 8-inch tree if sharpened enough. 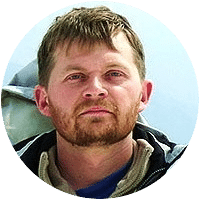 It is light and small enough to be carried anywhere but strong enough for many tasks associated with camping such as preparing firewood, cutting small branches, and pounding in tent stakes. The hatchet comes with a really nice quality thick, dark brown leather edge guard. The edge guard stays securely in place with one snap. It also has four heavy duty rivets on the leading edge. This is not a blade sheath. It is simply an edge guard for use when storing the hatchet. Related: A nice addition to this ax would be the YAE Axe Sheath for Husqvarna. This handmade leather sheath is custom made specifically for this ax. It is very high quality and durable and provides that extra level of safety. It is made out of raw cowhide and stained with Neatsfoot oil. 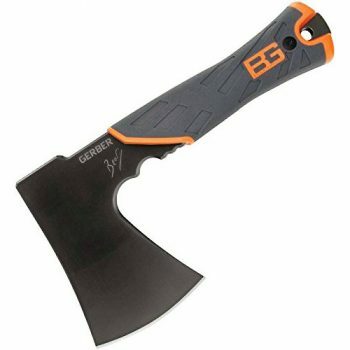 The Gerber Bear Grylls Survival Hatchet is a black-colored hatchet is a full tang (no welds means strength); with a very sharp blade that provides precise cuts. The steel is covered with the rugged PVD coating for durability. 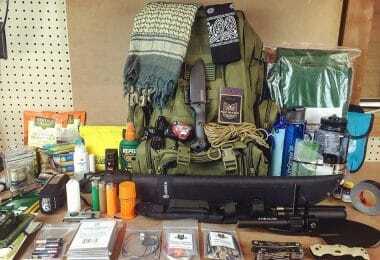 It will be a useful addition to your bug out bag or camping gear. The blade is made of 5Cr13 stainless steel that is 0.25 inches thick. The stainless steel is durable and of high carbon content, but could be better quality. This a small sized hatchet which can be easily carried in your gear or in a backpack. The convex curve of the blade makes chopping easier than if it were a straight blade. 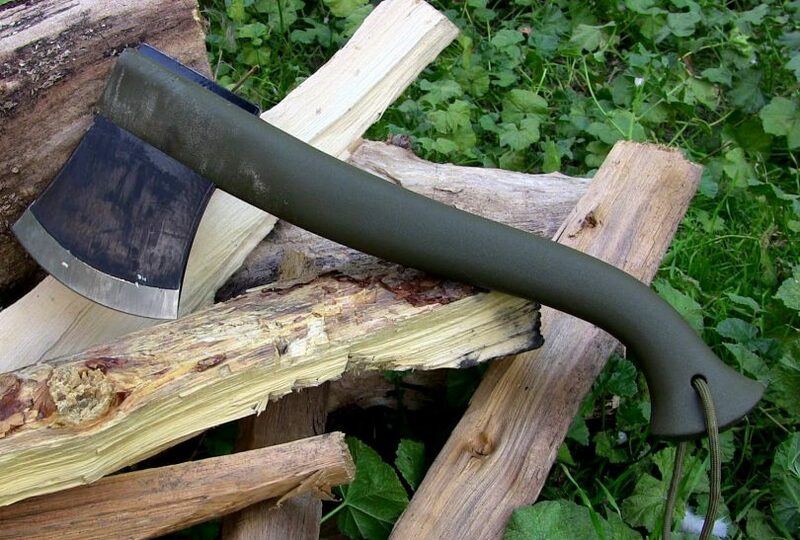 The edge is suitable for chopping trees, skinning bark, slicing, shelter building, making kindling and shaving tinder. Although small it is a tough hatchet and can easily cut firewood. It is compact and small, but powerful. The back of the head has a striking surface with a crosshatch pattern. This can be used for pounding in tent stakes or even tenderizing meat. The handle is made of non-slip rubber allowing for use in wet or dry conditions. It is ergonomically designed for easy gripping. The finger holes in the handle allow more precise control when stripping bark or feathering kindling, you can even use it for carving. It can easily chop firewood or split logs because most of the weight is concentrated in the head. There is a lanyard hole at the base of the handle so that you can attach a lanyard for extra safety. The blade comes with a polypropylene nylon sheath that is military grade and mildew-resistant. The sheath has loops so you can strap it to your pack or belt. The hatchet also comes with a free copy of Bear’s “Priorities of Survival” Pocket Guide. Related: A useful addition to this little hatchet would be a fire starter. We recommend the Gerber Bear Grylls Fire Starter. This is a nice compact fire starter that has a ferrocerium rod and metal striker and a waterproof storage compartment for tinder. It is lightweight and fits easily and neatly into a backpack. The Schrade SCAXE2 Survival Hatchet consists of a titanium coated 3Cr13 stainless steel head with a hammer pommel. The handle is made of black glass fiber. It has an ergonomic black TPR rubber grip to ensure safe and easy handling. The length and shape of the handle are very good. 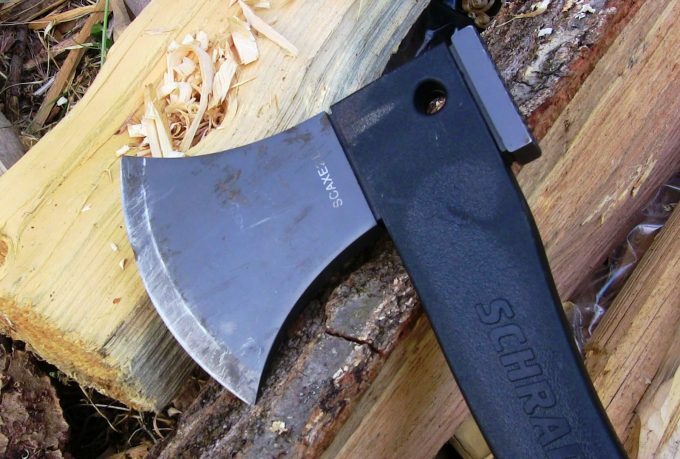 The ax head has a nice edge with a thick body, which may be too heavy for some, but it does allow one to chop down small trees and make kindling. The hatchet contains a Ferro rod inside the handle, which does make it on the heavy side. It is very convenient having a Ferro rod when camping. It is a nice handy way to make a fire using this integrated firestarter. This is obviously also good for survival purposes. It has a lanyard attached to the Ferro rod. The rod is 4 inches and easy to use to start a fire. The hatchet itself does not have a lanyard or a lanyard hole which is unfortunate as that would have been a nice added feature. The hatchet also comes with a thermoplastic belt sheath. This is not of very high quality or very durable though. Related: To maintain the sharp edge of the blade we recommend you buy the Whetstone Cutlery Knife Sharpening Stone. This stone is made from durable silicon carbide and has both a 400-grit side for returning edges to their original shape, and a 1000-grit side for smoothing and polishing cutting edges of blades. 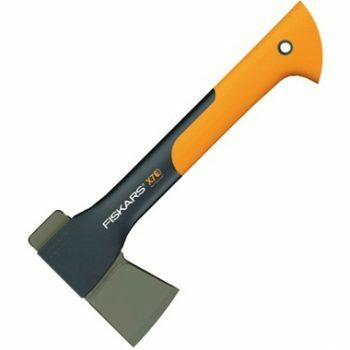 The Fiskars X7 14 Inch Hatchet has a good weight distribution, and advanced blade geometry. The blade has a very sharp edge and unbreakable design. It has more power at impact. The blade can bite deep into the wood when chopping so that you can chop more wood in less time and with less effort, and it chops three times deeper than most blades. You can chop kindling up to medium sized logs. This hatchet has a perfect balance and power-to-weight ratio which provides more power with each swing; it has an increased swing speed. It is lightweight and it is easy to sharpen the blade. The blade cover is a bit bulky though. It also does not come with a lanyard although it does have a lanyard hole. The blade is made using a proprietary blade-grinding technique which provides a sharper edge for better contact and cleaner cutting power. The blade is wedge-shaped and not curved so it is better for chopping wood than splitting wood. It has a strong, yet light FiberComp handle and inseparable insert-molded head, which provides toughness and durability and is thus virtually impossible to break. It comes with a lifetime warranty and is a good easy to carry size for hiking or backpacking. Related: We recommend also buying the Fiskars Axe and Knife Sharpener to keep your blade in top condition. It has a safety guard to protect your hand and fingers, and is made of durable FiberComp construction-reinforced fiberglass composite materials. This has a unique design that very quickly sharpens blades on axes, hatchets and knives. 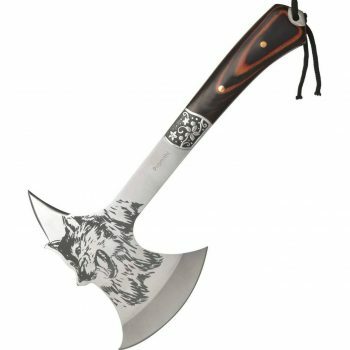 The Promithi Wolf Head Print Steel Hatchet has a double-ended blade with a nice curved edge which is great for splitting wood. The double-ended blade provides added strength and power. The blade also has a chiseled edge for picking, and the blade has a wolf head printed on it and is constructed of forged high carbon alloyed steel, with a hardness of up to HRC 56. The blade is also tempered for corrosion resistance and long-lasting durability. The handle of the hatchet is of a very attractive sanded wood with an etched blossom grip. The wooden handle gives this hatchet real strength and power. The handle of this hatchet is ergonomically designed and comes with a hole at the end for a hang-up hook or for attaching a lanyard. The hatchet also comes with a nylon sheath for the blade head. The sheath has snap closures to keep it secure. Related: To keep the blade of the hatchet nice and sharp we recommend buying the Marbles Back Pocket Sharpener. It tucks easily into your backpack or back pocket and can be used to sharpen all types of blades. 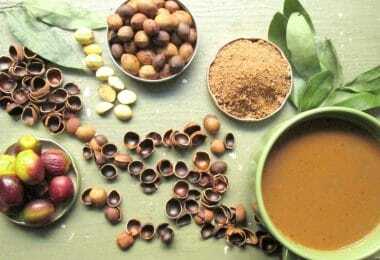 It weighs mere 8 ounces and has a 3-inch diameter, so is nice, small and easy to carry with you. The Gransfors Bruk Wildlife Hatchet comes with an extremely sharp blade (razor sharp), and is a very well made hatchet, designed for durability. The edge is easy to sharpen. The craftsmanship is very good and it is a well-balanced hatchet. The blade is very carefully forged by hand and greased to prevent rust from forming. The handle is made of hickory and the grain runs straight up and down. It is both attractive and provides a comfortable nice ergonomic grip. The wood on the handle may be too smooth for some, in which case it can be sanded to provide a better grip. The hatchet comes with a sheath that is made of vegetable tanned leather which prevents it from ripping your backpack. The hatchet comes with an “ax book” when you order it. Related: It might also be useful to purchase the Gransfors Bruks Ceramic Sharpening Stone. This quality sharpener, made of natural sandstone, will keep your hatchet blade in top condition. This is a ceramic stone with both a coarse and fine side, and can be used with or without water. 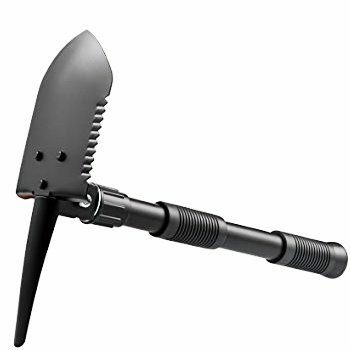 This black colored hatchet, KingCamp Multifunction Folding Shovel, is made of high carbon steel with a unique hollow out design to reduce weight. It is very light and easy to carry. The blade is sharp and strong. 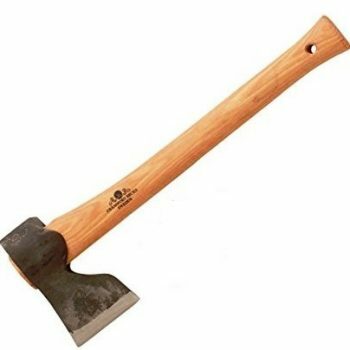 However, this hatchet is too light to use for chopping wood and can be easily dented as a result. The blade comes sharp, but it is very thin, and even though the hollow out design is nice for reducing weight, it reduces the strength of the blade as well. So, this is more of a disadvantage than an advantage. The entire hatchet can fold, which though convenient, also reduces the overall strength of the tool. The handle of the hatchet is made of non-slip nylon and fiberglass for a good grip. This is a strong material with a nice grip. The blade comes with two plastic covers for protection. The entire hatchet comes with a nylon bag. The nylon bag has a double snap fastener design to safely secure the hatchet and make it easy to carry. There is a belt ring behind the nylon bag which can be used to attach the bag to a belt. It is light enough to carry on a belt, and being so light it can very easily be carried in a bug out bag or backpack. Related: To keep your blade sharp we also recommend buying a sharpening stone, for instance the Puck Dual Grit Knife Sharpener, which has coarse and fine grit. The puck has a Dual-Grit design which provides both a coarse side for cutting and shaping, and a medium side for final sharpening and finishing of the blade edge. 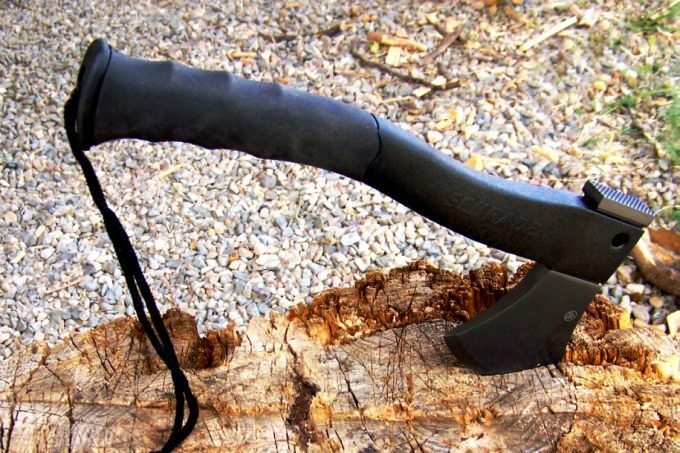 To sum up, choosing the best survival hatchet depends on your needs. The type of blade and handle, and materials that are used to make these are important factors to consider. How you plan on using the hatchet is also obviously important. If you don’t plan on chopping and splitting wood then a cheaper lightweight hatchet may be fine. 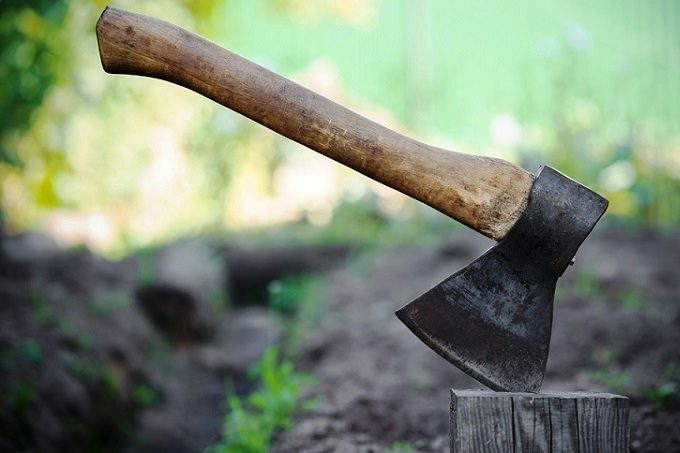 However, if you plan on having a durable long-lasting hatchet for chopping and cutting, then you need to buy a stronger, slightly heavier, better-forged hatchet. 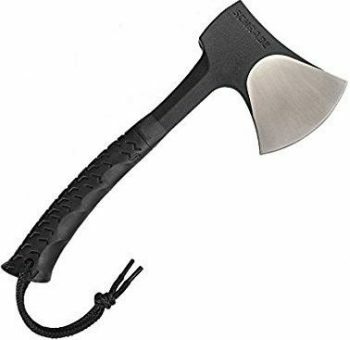 Are there other hatchets that you know of that we should include in our list? What other features do you think are important in choosing a hatchet? Let us know your thoughts in the comment section below!